At the University of Rhode Island in the United States, a study of electromagnetic field (EMF) impacts on elasmobranchs and lobsters is currently being conducted. The contract is led by the Bureau of Ocean Energy Management and the study aims to assess impacts of direct current (DC) cables on marine organisms. The study was prompted by the potential for the “Atlantic Wind Connection” venture, a high-capacity, lengthy DC cable supported by Google to connect all wind farms in the mid-Atlantic. 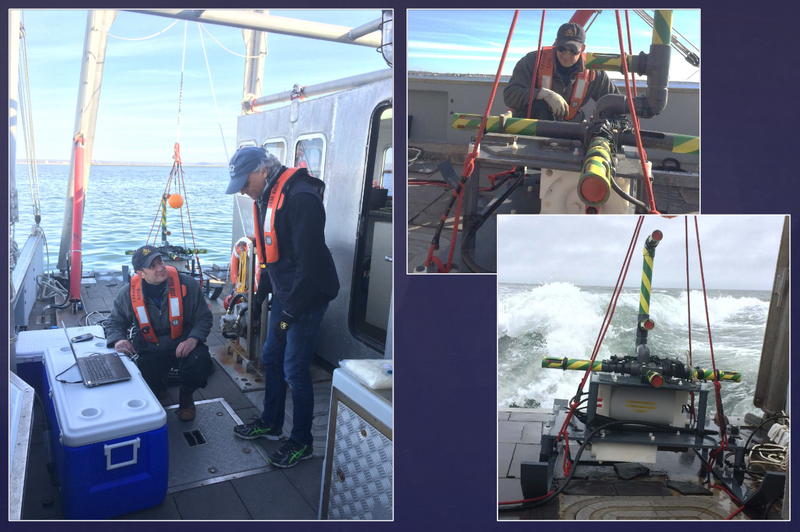 To study the magnetic and electrical impacts on marine organisms from DC cables, two existing cables, the Cross Sound cable and the Neptune cable, were identified to conduct surveys. While the current study focuses specifically on the Cross Sound cable, which is a buried cable installed outside New Haven Harbor, the research team has plans to also survey the Neptune cable. The Cross-Sound cable is a 40km (25mi), 150 kV, streel armor-shielded cable comprised of two cables bundled together. The study assessed electric and magnetic fields around the cable as well as impacts to skates (elasmobranchs that resemble rays), for which there is a wide body of research, and lobsters, which comparatively have been less well studied. The project brought together researchers, technical mapping staff, and divers from the University of Rhode Island, Cranfield University, and the Swedish Defense Agency. Two assessments were conducted around the Cross Sound cable. A survey of electric and magnetic fields of the cable in three modes – shutdown, standby, and full power operation mode – using SEMLA (Swedish Electrical and Magnetic Field Low Noise Apparatus), a magnetometer and electrical field sensor array. In shutdown mode, the magnetic field showed permanent fields peaking closest to the cable; in standby mode the peaks are slightly higher but followed the same peak shape and dissipated at about the same distance from the cable. At full operational mode, the peaks were similar in shape, but showed higher magnetic output that dissipated further from the cable. Electric fields were fairly low in shutdown mode, while in full power mode the electric field picked up considerably and peaked nearest to the cable, expanding higher and wider than expected. This empirical study contradicted previous modelling outputs that did not predict magnetic anomalies travelling as far from the cable as measured in the field, as well as field measurements showing larger and more complex peaks for both electric and magnetic fields than predicted. The second portion of the study assessed the movement of lobsters and skates around the cable. 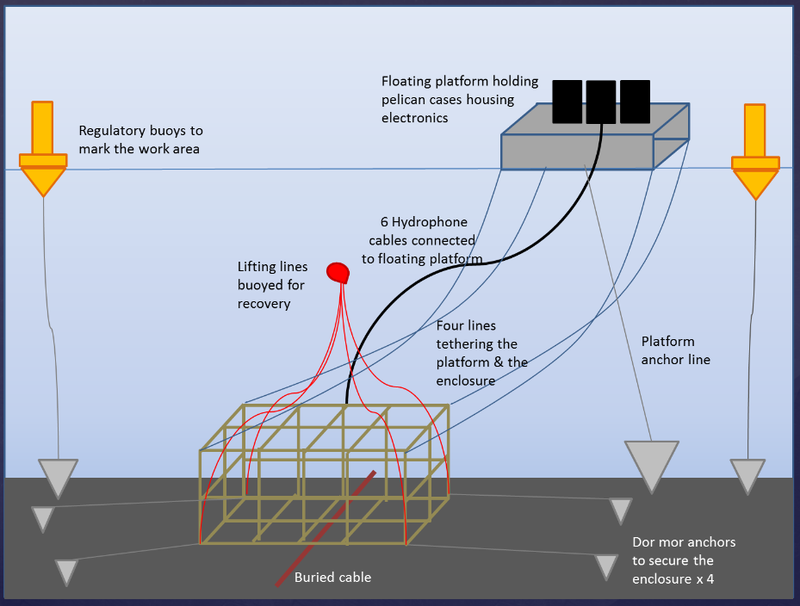 Lobsters and skates were captured, outfitted with acoustic telemetry tags, and placed in two enclosures (6m x 8m x 2.5m), one located on the cable and another used as a control distant from the cable, for a 24 hour period. Floating hydrophones were used to monitor the skate and lobster movements and GoPro cameras followed the animals to help ground truth the acoustic tags. The results showed frequent pings from the telemetry tags, demonstrating that acoustic tagging are a useful tool for tracking multiple individuals within an experimental environment, and the cameras confirmed the high precision and accuracy of 3D positioning. These results will support future assessments of a whole host of movements, impacts, environmental variables, on marine animals on the seafloor, in both two and three dimensions.